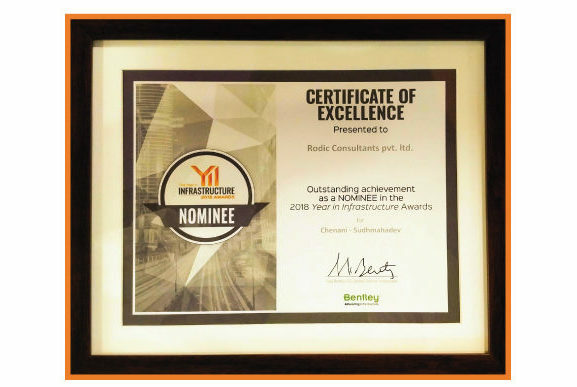 Rodic is proud to be the recipient of Outstanding Achievement as a Nominee in the 2018 Year in Infrastructure (YII) Awards for Chenani-Sudhmahadev by Bentley Infrastructure and Engineering Software and Solutions. Kudos to our Highway Designing Team for their technical expertise and their relentless efforts for completing the Detailed Project Report in a record-breaking, one and a half month timeline! Rodic Consultants was retained to prepare a detailed project report for the upgrade and construction of the Chenani-Sudh Mahadev road stretch in the state of Jammu and Kashmir, India. The existing roadway length is 23 kilometres, situated amid hilly terrain. Faced with the constraints and no previous data, the consultants required comprehensive civil modelling technology to deliver INR 2.73 billion project. When completed, the roadway will be an alternate highway connecting Srinagar, and it will contribute to the overall development of Jammu and Kashmir. The team used OpenRoads for detailed project design on the alignment, calculating accurate earthquake quantities to establish an alignment that accommodates the site constraints. STAAD facilitated design of the numerous structures along the highway. Using the design capabilities in OpenRoads enabled the team to reduce the length of the existing alignment by 6 kilometres and ensured the project met the standards of the IRC Manual.